This unique Napkin Basket would look great sitting on your counter filled with napkins, paperwork or pencils. The Napkin Basket can even hang on your wall. Finished basket measures approximately 3" wide, 6" long, and 6" high. It is a fun basket, very useful and simple to make. You can easily change its appearance by adding a few rows of dyed weavers or choosing another wire hanger such as the heart or the tree. 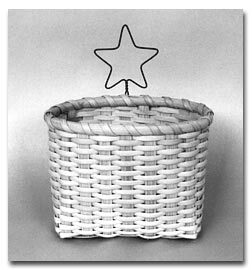 Calculate Supplies for 1 to 20 Napkin Baskets with Star wire Hanger with the Basket Supply Calculator. The Supply List gives you the least expensive way to purchase the supplies for your quantity of baskets. View on-line or print to your printer. *These items have been rounded to 1 pound because it is less expensive to purchase 1 pound than to purchase the foot quantity. When sorting through your material, choose the lightest weight (thinnest) pieces for your lashing. You'll need about 5-6 feet. Cut 3 pieces 22" long and 7 pieces 18" long from 1/2" Flat Reed. These pieces (stakes) will form the base of your basket. Also cut 2 pieces 10" long from 1/2" Flat Reed for your base fillers. Make a small pencil mark on the rough side at the center of each piece. Soak these until they are thoroughly wet and pliable. Lay one 22" stake rough side up tightly against a 10" base filler. Align the pencil mark on the 22" stake with the pencil mark on the base filler. See Fig. 1. Continue laying out stake, filler, and stake and you will have the three 22" stakes and two 10" base fillers in an alternating pattern with the 22" stakes to the outside. See Fig. 1. You will weave the center 18" stake first. The center stake must weave over the 22 " stakes and under both fillers. See Fig. 2. Add the other stakes placing 3 stakes on each side of the center stake, alternating the weaving pattern and spacing all stakes a full 1/2" apart. Match the center pencil marks each time you add a stake. See Fig. 3. After weaving all 7 of the 18" stakes into the base, adjust the stakes and fillers a bit so that the base measures about 6" x 2.5". The end of each stake on all sides of the base should extend about 8" beyond the woven edge of the base. Place a clothespin in each corner to secure the base. Soak the base in warm water for two minutes. At the edge of the base on all 4 sides, gently "upset the basket" by creasing each stake and each base filler upward at a right angle to the base (rough side to inside). The stakes may crack and splinter as you crease them. See Fig. 4. Trim base filler pieces to a length of 1.5" from the crease. To complete filling the base, cut each filler through the center to the crease making 2 narrower ends. Spread the 2 ends apart and tuck each piece under the second 18" stake on either side of that base filler. See Fig. 5. A basketry packing tool is very helpful when tucking. Trim, cut and tuck each end of both base filler pieces. This basket is woven using a chasing weave. Although you have essentially 2 weavers at a time, you will weave around the basket with one weaver (the weaver closest to the base) then drop that weaver and pick up the other weaver for a row, etc. NOTE: The first weaver should continue the alternating weave found on the long sides of the basket's base. Soak a long piece of 1/4" Flat Oval Reed (weaver) then fold it near the center lengthwise. Starting 4" from the fold on each side, taper the weaver at an angle toward the fold so that it is narrower at the fold. The overall length of the cut should be about 8". See Fig. 6. Beginning with the third stake from the left (on a side where you have 7 stakes), place the folded weaver around the stake. The lower piece of the weaver should be outside the stake with its oval side to the outside. Using the lower piece of the weaver, weave behind the fourth stake and outside the fifth stake continuing around one row. I usually use a couple of clothespins per side to hold the first several rows of weaving in place. Now, chase the first row of weaving with the other end of your weaver. You'll weave outside the fourth stake, behind the fifth stake, etc. See Fig. 7. Twist the weaver before you begin to weave so the oval side of the reed is to the outside. Continue to weave rows of your basket by using first one weaver then the next. Round the corners of your basket as you weave and pay careful attention to the corner areas--do not pull the weavers too tightly at each corner. Remember: Weave with an even tension. Keep the stakes vertical and equal distance apart. Also, bend (or weave) the weavers around the stakes. The lower edge of the piece you are weaving should touch the upper edge of the previous weaver. To add another weaver, overlap the old weaver with a new piece and hide the ends behind the uprights. Continue weaving until the basket is about 5" high and you are on the side of the basket where your weaving began. Taper the last 4" of both weavers so that they blend into the top of your basket, Cut the weavers to stop behind a stake on the basket's inside. Now weave a Final Row of 1/4" Flat Oval around the top of your basket and overlap the ends, See Fig. 8. Starting at the bottom of your basket "pack-down" the rows of weaving so all the rows touch each other. Tuck every folded stake over the top weaver and under the third weaver from the top. Trim your stake to length before tucking it so that it hides behind the third weaver from the top and is not visible on the inside of your basket, A bone folder or basketry tool will help open the weaver to accept the stake. Cut the remaining stakes even with the top of the basket. See Fig. 9. Insert your Wire Hanger into the outside of your basket behind a weaver or two, Make sure the hanger is centered. See Fig. 10. Cut a length of 3/8" Flat Oval Reed for the outside rim and a length of 3/8" Flat Oval Reed for the inside rim. The length of your outside rim is equal to the distance around the top of your basket plus 3" (for overlap). The inside rim is 2" shorter than the outside rim. Soak the rims for 5 minutes in hot water. In order to form a smooth joint where the rims overlap, you must carve or whittle both ends of each rim. Whittle the rounded side of one end at an angle and the flat side of the other end at the same angle. See Fig. 11. To determine exactly where you should carve, attach the outside rim around the top of your basket (with clothespins). Mark the rims where they overlap--mark the rounded side of one end of the rim and the flat side of the other end. Remove the rim and carve the rim (carve the flat side of one end and the rounded side of the other end) to form a smooth overlapping joint as illustrated in Fig. 11. Repeat this process with the inside rim. After carving the rims, make sure they are still pliable (if not, soak again). With the rim's rounded side facing inward, place the inside rim inside the basket-- secure with clothespins. Place the outside rim around your basket with the rounded side facing outward and clothespin in place. Locate the overlapping sections of the rims on the back of the basket with the inside rim overlap to one side of the wire hanger and the outside rim overlap to the other side of the hanger. Cut a piece of #6 Round Reed for your rim filler the same length as your outside rim. Soak the Reed for a minute or two in warm water. Taper both ends where they will overlap. Place the Round Reed around the top of your basket between the rims allowing it to overlap where the outside rim overlaps. Secure rims and rim filler with clothespins or twist ties. With a wet flexible piece of 1/4" Flat Oval Reed begin lashing just past the outside rim overlap (to allow for adjustment later if needed). Thin one end for a couple of inches. Secure this end of the 1/4" Flat Oval Reed under the inside rim, beneath the #6 Round, and under the outside rim as shown in Fig. 12. Note: Secure and insert the 1/4" Flat Oval Reed with the oval side continuously to the outside . Working left to right from the outside of your basket, bring the long end of the 1/4" Flat Oval Reed over the rims and insert between two stakes to the inside of the basket just below the bottom of the rims. Pull the Reed through to the inside until you have about one arm's-length of Reed on the inside of your basket. Now, insert the Reed's end between the next two stakes and pull it to the inside until you have a loose loop of Reed around the rims. After making 3 or 4 loops around the rims and between the stakes, tighten the loops of Reed---one at a time---from left to right by pulling to the inside. Repeat the looping and tightening process working your way around the basket. If the Reed becomes dry, simply soak it again before continuing. Remove the clothespins as you progress. See Fig. 13. When you have lashed around the entire basket, finish the 1/4" Flat Oval Reed on the inside of the basket by taking its end behind a couple of weavers then upward over one weaver and behind another weaver. Trim the end. See Fig. 14.